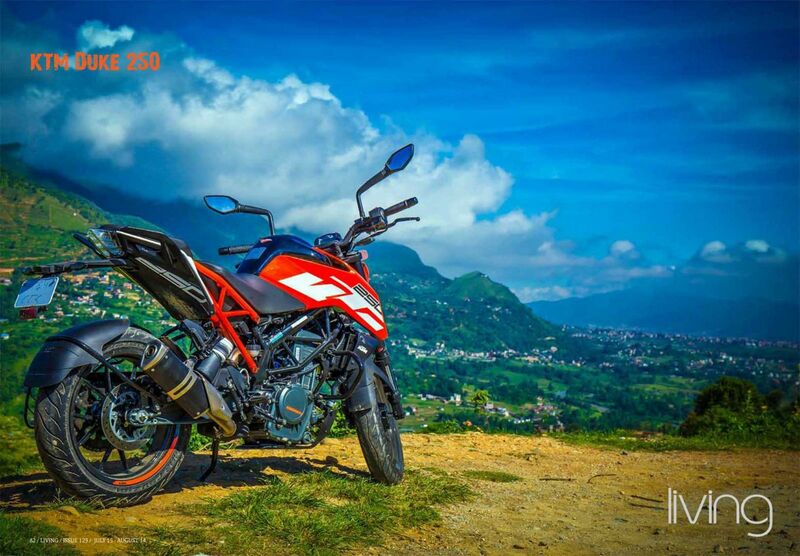 KTM motorcycles brought in by Hansraj Hulaschand & Co has never failed to surprise motorcycle enthusiasts since 2012 which is why the brand is so popular in Nepal. Although it was a long wait to get our hands on the new 2017 version of KTM Duke 250 and Duke 390, it was definitely worth the wait. What you first notice about the new KTM Duke 390 is the updated style borrowed from its older brother, the 1290 Super Duke R. It has created a motorcycle that looks more beefy and well-built with a quality facade. The 2017 version also has a six-LED headlight, an improved frame and bolts on sub-frame making it easy for the owners to change the chassis. It also has a wheelbase that is shortened by 10 mm and the trail by 5 mm, leaving the steering head angle the same. The seat height of the new Duke 390 is 32.7 inches compared to 31.5 inches in the older machine and the seats are also a tad wider at the back and slimmer at the front. Thus, this has made the motorcycle’s seating position more aggressive but does not have any effect on the riders’ comfort. In the KTM Duke 390 2017, the new fuel tank can hold an extra 2.4 liters of fuel and is made out of steel. All these are monitored by the new dash system about which we’ll talk about in the next paragraph. 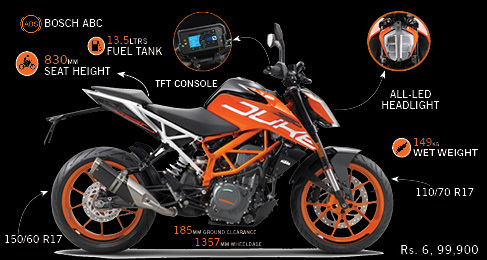 One of the major changes in the 2017 Duke 390 for which KTM has come up with a huge price tag is the TFT dash. The new dash presents riders plenty of information about their motorcycle. Compared to the old one, the new dash is bigger, brighter and clearer to see everything that’s going on with the motorcycle. Riders can also link their phones to the TFT dash via Bluetooth to handle calls and music. As for the ABS control, you can choose between three different levels of ABS which are off, road and sup mot. KTM Duke 390 has to undergo major changes in terms of performance in order to meet Euro 4 emissions standards and to help the new motorcycle breathe cleaner. The changes include revamped exhaust, catalytic converter, a larger airbox, a retuned fuel map, and a throttle-by-wire system. If you think that the emissions regulations have reduced the Duke 390 to a choking performance, it hasn’t. Instead we felt the reverse is true. The peak power output might be the same but the peak torque has been amplified and comes on at about 250 rpm quicker, at 7,000 rpm. The weight of KTM Duke 390 2017 is 10 kg more than the previous one at 149 kg because of the new exhaust, a new steel fuel tank and escalating frame for the LED headlight. But even with the extra mass, you’ll feel that the motorcycle is still a very light machine. The new Duke 390 may still operate on the same ByBre calipers but they have used a larger 320 mm disc plate on the front wheel combined with a revised master cylinder. This has enormously improved the braking from the old Duke 390. The suspensions on the previous Dukes were sporty and could handle any rough roads and potholes. The suspension in the new Duke 390 might look almost the same, but inside these suspensions a lot is new. Instead of a “big piston” design, the 2017 version of Duke 390 has the 43 mm WP fork with an open cartridge design with a pair of escalating springs. Although the suspensions are less tunable, they work better, are feathery and require fewer repairs. The rear suspensions are still adjustable and as the new suspension is placed openly beside the exhaust head, we wonder if the location of the exhaust will heat up the suspension oil and affect its performance. To ride the Duke 390, we wanted to test it in the open road when there was less traffic. So we decided to ride at night and asked a Duke 390 owner, Aakash Lama Moktan for his machine and also got his views on the motorcycle. As mentioned before, the throttle response of the Duke 390 was very good thanks to its ride-by-wire system. The tires had a good grip which assisted the brakes while stopping and the suspensions together with comfortable seats made our ride very pleasant. The KTM is 10 kg heavier than its previous version, but we didn’t feel the weight at all and sailed through the streets of Kathmandu. I just adored everything in the 2017 version of KTM Duke 390 and the price of Rs. 6, 99,900 for the motorcycle is absolutely reasonable. The aggressive design taken from 1290 Super Duke R, the luminous LED-Headlights, the retuned torque in the engine, the improvement in the braking system, the new exhaust and especially the TFT dash has definitely justified the title of “The Beast Reborn” for this 2017 version of the KTM Duke 390. Like the KTM Duke 390, KTM 250 Duke also shares the design of the 1290 Super Duke R giving it a striking appearance for a 250cc motorcycle. The jagged shapes are personified with remarkable detailing and the muscular fuel tank has been upgraded to 13.5 liters which is 3 liters larger than that of the 200 making it an adequate motorcycle for travelling purposes also. The Duke 250 also gets a new headlamp cluster, uses a halogen bulb and features the boomerang-shaped DRLs. What’s noteworthy in the Duke 250 are the modified trellis chassis with the finishing in black and neon orange color theme , and the side-mounted aluminum exhaust similar to the Duke 390’s which has made the exhaust sound calmer than before. Because of the new side-mounted exhaust and removal of the under-belly exhaust, the ground clearance has increased by 20 mm at 185mm which is friendlier to the current state of roads in Kathmandu and the highways. Again, similar to the Duke 390, Duke 250 also has a better seat for both the rider and pillion. The footrest has been shifted a bit to the rear and the handlebar seems to have gone slightly wider on this motorcycle. The seat has also been raised bringing it to the new height of 830mm. Although there are major changes in the Duke 250 which are similar to Duke 390, there are also certain areas where the 250cc has the same components as the Duke 200 including clutch, brake levers, tires and instrumental console. Yes, the major blow in the Duke 250 might be the missing TFT Dash but that’s been done to keep the costs in check. The Duke 250 is slightly costlier than the 200cc but a margin cheaper than the 390cc. As for the power and engine, KTM Duke 250 uses the BS IV compliant 248.8 cc engine derived from the Duke 390's 373.2 cc unit. The engine is a liquid-cooled, single-cylinder motor, tossing out power of 29.6 bhp which is around a bhp less than the international version and 24 Nm of torque at 7500 rpm. One might think that because of the beefy look KTM 250 might be heavier but in reality, it is a kilogram less than the Duke 200. The KTM Duke 250 has plenty of power and torque. Although you might feel plenty of power in the motorcycle, the addition of the Power Assist Slipper Clutch (PASC) makes sure downshifts occur effortlessly, and doesn’t cause the rear wheel to lock at high speeds. The Duke 250 also profits from the extra complicated open cartridge USD front forks and monoshock suspension system introduced in the 2017 version of Duke 390 as well. When you ride the motorcycle you will feel a quality ride and if compared to older Dukes, everything is far better in this version from soft cushioning seats, control of the motorcycle and the suspensions. Even though the KTM Duke 250 has the same braking system as the Duke 200, 300mm and 230mm disc brakes at front and rear respectively, a braking system is sufficient while riding in the city but might not be adequate when you crank the machine to 30 bhp. Moreover, the Duke 250 also doesn’t have ABS as an option. 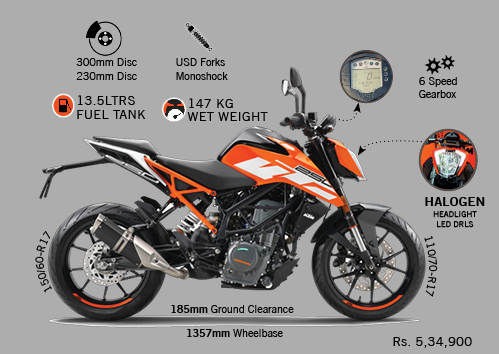 As for the tires, KTM Duke 250 is equipped with MRF RevZ tires, and not the highly appreciated Metzelers like in the Duke 390. Although there are no Metzelers in the 250cc motorcycle, the MRF tires work just as well and handle the traction very well at all times. The tires are really good and durable if you take into consideration what you are buying them for and what you are getting. The Duke 250 was a highly anticipated motorcycle here in Nepal because it belongs to the 250cc segment. Yes we do have Honda CBR 250 which is a street sport motorcycle, Cross X and Crossfire which belong to the dirt/enduro segment, but we really didn’t have one in the naked sport segment. So with the KTM Duke 250, now naked sport motorcycle lovers can enjoy the thrill and comfort in this segment too. As for the price, Duke 250 costs Rs. 5, 34,900 filling the gap between the higher priced Duke 390 as mentioned in the previous article, and Duke’s entry level model the Duke 200 which is priced at Rs. 4, 44,900. So, KTM Duke 250 is the right product to move into if you love naked sport motorcycles, want to upgrade from 200cc motorcycles but still not ready to go for the Duke 390 or move into higher displacement motorcycles.